It's criminal, really. At a time when many acts on the radio couldn't write a receipt, let alone a tune, Four Eyes featuring Mark DeCerbo, the band's first full-length release, represents a largely untapped embarrassment of riches, spanning the breadth of the eighties. Oh, it's true frontman Mark DeCerbo has come close a few times, recording sessions with Greg Kihn, demos and an unreleased album for MCA, demos for CBS, and more. Its easy to see why all the interest - amongst the gems contained in the DeCerbo/Four Eyes archive are some of the most memorable melodies you're ever likely to hear. Corked and bottle-necked inside is a decades worth of music just waiting to explode, and you'll get powerpop at it's best, with a heavy emphasis on the pop. You're gonna hear echoes of this and that - 20/20, Phil's Seymour and Spector, Elvis Costello, Squeeze, and the Beatles. It all means a dedication to song craft, as well as a guaranteed heartfelt performance. Some songs pound out their message, others sweetly inform. Why this music hasn't reached a larger audience is beyond reason, but Mark DeCerbo continues to write and perform incredible pop material - witness his 1992 solo album on Bizarre/Planet, and "Green Grass Girls" on "Staring At The Sun Vol. 4." Count Four Eyes featuring Mark DeCerbo as an opening salvo in re-vitalized release schedule. In the meantime, in a career as lengthy as this, there's a lot of ground to cover. Even a cursory look would show us that Four Eyes themselves got their start in San Diego circa 1976 as a country boogie band, eventually mutating into a power-pop group called Copenhagen. The quintet lasted just over two years, during which time the group shared a two room flat at the Catamaran Hotel, while nominally the house band at Webb's in Ocean Beach. Copenhagen became the backing band for both blues guitarist Tomcat Courtney and art rocker Gary Wilson, even joining him on a short promo tour for his legendary "You Think You Really Know Me" album. The line up changed often in their short life span, but by the time their incredibly rare 45 "Tonight/Don't Sail Too Near The Wind" was issued, Copenhagen consisted of DeCerbo (guitar, vocals), Jeff Becker (guitar), "Mighty" Joe Longa (harmonica and keyboards, later with the Jacks and Powerthud), Barry Scott (guitar and vocals, Chris Creasman (bass, vocals) and Steve Bidrowski (drums, later of the Unknowns)- the single by the way is as melodic a piece of jangly pop rock as you're likely to find. Also of note they opened for Cajun legend Doug Kershaw at the La Mesa Lanes Bowling alley, and promptly had their keyboard player nicked by Kershaw. 1979 was the year they released that single, and the band continued to play as often as possible, from military bases to country western bars, some shows clearly more successful than others. Barry Scott departed joining east coast rockers The States while Copenhagen carried on supporting their single with live shows and recording new material during what is now lovingly referred to as the Eichenlaub Sessions. Goff Macareg replaced Chris Creasman on bass and in 1980 the quartet scored an appearance on TV's legendary Gong Show as Four Eyes. They performed Little Richard's "Tutti Frutti," and more importantly, didn't get gonged. They did get a few hundred bucks between them and won a year's supply of Turtle Wax and Mister Coffee Machines. Jamie Farr, of "M*A*S*H*" fame was quoted on air as saying about the bands performance: "Loved the tutti, hated the fruitti." During this time frame with new wave in full force, and the nearby Sunset Strip bursting with great pop bands, the group set its sights towards the world's recording capital, Hollywood. Steve Bidrowski soon departed, to join The Unknowns and a brief stint on Sire records, while Fred Dunsmore took his place in the band. Macareg departed soon after as well, leaving the band without a bass player. Unable to find a replacement bassist who could also sing and determined not to miss a beat or a gig, they bought a bass and gave it to the guy in the band with the voice, DeCerbo. The start of the eighties found Mark Shapiro becoming the groups' manager/agent and financial backer, with the result being the trio of DeCerbo, Becker, and Dunsmore releasing Four Eyes only single, the classic "Disengaged/Penny Pong” for Shapiros’ Big Fish label. Having a release enabled them to not only get more local gigs, but also more Los Angeles dates. During this time they were regulars at such storied locations as Madame Wong's, The Hong Kong Cafe, The Country Club, and even UCLA frat parties. That's in addition to such San Diego hot spots as the Spirit and Skeleton Club, of course. all this flurry of activity brought the labels sniffing around like sharks to the blue plate special. It's this major label interest that we can thank for the wealth of material that we've been able to unearth. The band loved the studio, and over the years has taped literally dozens of tunes, and multiple takes and sessions of most of them at that. Their first brush with the mainstream came when CBS had them tape a series of demos, including takes of "Contagious", "Colorblind", and "Baby's Not in the Mood." The label passed on the group, but their disappointment in not securing a deal with CBS was short lived as they soon signed with MCA Records, part of the labels signing spree in San Diego at the time which included Joey Harris & The Speedsters, DFX2, and Trees. The proposed album was produced by another San Diego resident, Dane Conover, best known for his work with The Puppies, Blue Wind and the previously mentioned Trees. Impressively, it was also engineered by Earle Mankey, legendary for his work with The Beach Boys, 20/20, Sparks, and Concrete Blonde, to name just a few. Unfortunately, even though the album was completed, in 1985 Irving Azoff took over MCA, and most new signings, including Four Eyes, were dropped. The band was offered the chance to issue one single as a test, but in a move that the band still questions to this day; they turned that offer down. That would be the last anyone heard of those recordings- until the CD you hold in your hands. Interest in the band was still high however and Mac Falk, of the Belly Up Tavern nightclub, became their manager, with the band replacing the always energetic Dunsmore by bringing aboard Lee Knight & Mark Spriggs both ex-members of Joey Harris and the Speedsters for the rhythm section. It's at this point that DeCerbo, although a focal point before, became the band's undisputed front man. The group remained live favorites and could be found performing at all sorts of events, ranging from teen dances to opening for the likes of Nick Lowe, Paul Carrack, John Hiatt, The Romantics, Marshall Crenshaw, and John Mayall. In an odd move, the band changed its name to Five Lines Up for a short period, but then rightly changed it back to Four Eyes. Still looking for a deal, the band kept returning to the studio, taping tunes with both Paul Fox (XTC, Boy George producer) and Jack Mack's Heart Attack Horns. Chatfield and Spriggs both exited, each pursuing his own musical interests, and Bob Sale (ex-Rick "That Thing You Do" Elias Band) was soon playing drums for the now-streamlined quartet. Four Eyes last gig was a 2-night engagement in 1990 at Fat City in San Diego. Chris "Uncle Outer Space" Drake from another local outfit, Private Domain, best known for their 1984 turntable hit "Absolute Perfection," played bass for the final few months as Knight had already left to pursue other interests. Not long after the band split, DeCerbo scored a deal with Capitol Records distributed label Bizarre/Planet. Showing less than six degrees of separation, the label was co-founded by another former San Diegan, Frank Zappa, and was also in the midst of a local signing spree that would include Buddy Blue, Joy Eden Harrison, Earl Thomas, Gregory Page and the Rugburns. DeCerbo released one album with Bizarre/Planet, "Baby's Not In The Mood, " but despite rave reviews in Billboard, that association would be short lived. In the ensuing years, DeCerbo has continued to perform and record. In 1993 he taped a version of "Blue In Clover" for an album called “Signatures," with Mike Keneally on second guitar. The song was recorded live at KGB-FM studios, with DeCerbo contributing to three of Keneally's solo albums over the next decade as well. In 1994 he taped a new version of "Contagious" for a kitschy, but still kinda cool, ABC-TV Movie of the Week, "Mike Hammer: Come Die With Me. His band even makes a brief appearance during a bikini contest filmed in front of the Mission Bay Roller Coaster. Meanwhile Four Eyes regrouped performing as part of a special tribute to legendary San Diego DJ Jim McInnes in 2002 and is currently headling shows at The Casbah, Lestats and Canes in San Diego with Australian popsters The Chevelles, The Shambles, Gregory Page and many more. 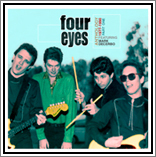 Fueling Four Eyes' resurgence, as well are new recordings on at least four other compilations in 2005 including Ringo Starr and Neil Diamond tribute albums. Four Eyes performed at the International Pop Overthrow 2004 in Los Angeles, was nominated in the Pop Music category for the San Diego Music Awards 2004 and is currently recording a new album due for release in 2005. While the band never achieved it's due during their previous lifetime, it is still very fortunate that all these great tunes have been preserved for future generations, and are finally seeing the light of day. That these songs still sound fresh and vital, after decades, is a testament to both the great songwriting as well as ace musicianship. True some of these tunes are very much "of their era," but that merely adds to their innate charm. If you're a fan in the slightest of great powerpop, rock 'n' roll, or simply songwriters who know their way around a tune, then the 19 tracks found on Four Eyes featuring Mark DeCerbo represent a treasure trove of amazing proportions. With a little bit of luck and much perseverance, look for another collection of outtakes and rarities as well as brand new songs and recordings from Four Eyes in the near future. It's a fact they are back and this is just the tip of the iceberg.